The Motion Picture Association of America Production Code Administration records span the years 1927-1967 and encompass 240 linear feet. The collection contains approximately 19,500 titles and chronicles the activities of the Production Code Administration (PCA) in relation to specific films and properties submitted to the MPAA for approval. 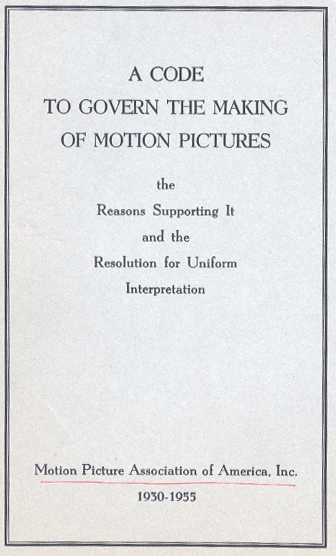 The files contain a variety of material, including film reviews and other articles; correspondence, primarily between the MPAA and studio officials and representatives of special interest groups; interoffice memos and memos "to the files"; code certificates; analysis charts; synopses; credit sheets; theater and book reviews; and censor board reports. Other items include script excerpts, treatments, music/lyrics, meeting notes, and in rare instances, stills. The sizes of the files vary; some contain as little as one item, while others have extensive and detailed coverage. The collection includes files on unproduced as well as produced properties. Of the produced films, the majority appear to be American feature-length motion pictures, although a limited number of foreign films, cartoons, serials, shorts, and documentaries are represented as well. Unproduced or unrealized project files contain correspondence and occasionally stage and literary reviews and preliminary story material. A number of untitled ideas for films are listed by subject matter; for instance, "Abortion Picture" and "Story on Narcotics." The Motion Picture Producers and Distributors of America (MPPDA) was formed in 1922, primarily to defend the film industry against censorship. The first president was Will Hays, who embarked on a vigorous campaign to improve the image of the motion picture industry. In 1930, Hays introduced the Production Code, a document designed to help the industry regulate itself by following certain moral principles and guidelines. There was no enforcement mechanism in place, however, and the studios often chose to ignore the Production Code staff’s advice and admonitions, leading to the release of many films that raised the ire of local censors and moral watchdogs. In 1934, after the newly formed Legion of Decency threatened to lead a boycott against Hollywood movies, Hays chose Joseph Breen to oversee the administration of the Code. Under Breen, the studios were required to submit all screenplays for approval and the Code was much more strictly enforced. In addition, all of the major motion picture exhibitors agreed that they would only screen films that had received a Production Code seal of approval from the MPPDA, making it much more difficult to release a film that had not been scrutinized by Breen and his staff. In 1946, the organization changed its name to the Motion Picture Association of America (MPAA) and Hays retired and was succeeded by Eric Johnston. Although the Production Code went through several challenges and revisions over the years, it remained in force until November 1, 1968, when it was superseded by the MPAA ratings system, which is still in use today.